Haha and I just <3 this! That's one hell of a love letter. Whoever got that should marry that person. aww the student hearts the teacher..
why be sad you are intelligent? WHAT AN ADORABLE NERDY LOVE LETTER!!!!! It makes me sad that I understand the math here. I just learned it in class last week. This is wonderful. Man, whoever spent the time to write that must REALLY less than three the other person! U should have used Cauchy's criteria instead of D'alambert's. <3 I think is the joke. Only a person who understands quantum physics and every maths equation could read this as a letter, not an equation to utter destruction of the earth!! damn. should have done that on my math homework. LOL i "Less than three" this picture. Wait, is this a student-to-teacher thing? And the math is sound, but I don't understand the question. 'Am I the only one that doesn't get this?' No, no you are not. all i have to say is WTF?? he must seriously want a detention cos it would of been OK without that little section. 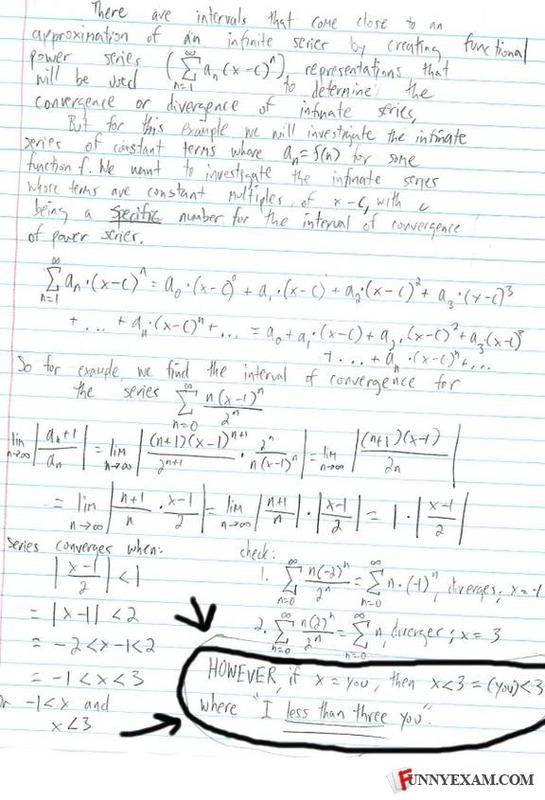 Actually, his description of the Taylor Series is slightly off. Rather than defining an=f(n), he should have put the infinite series from n=0 to infinity of ((f^n(c))*(x^n))/(n!). Other than that, his calculus is sound. This makes no sense what so ever and is retarded. Wait a minute, you can't have inequations with imaginary numbers! This seems like something the creator of XKCD would write.